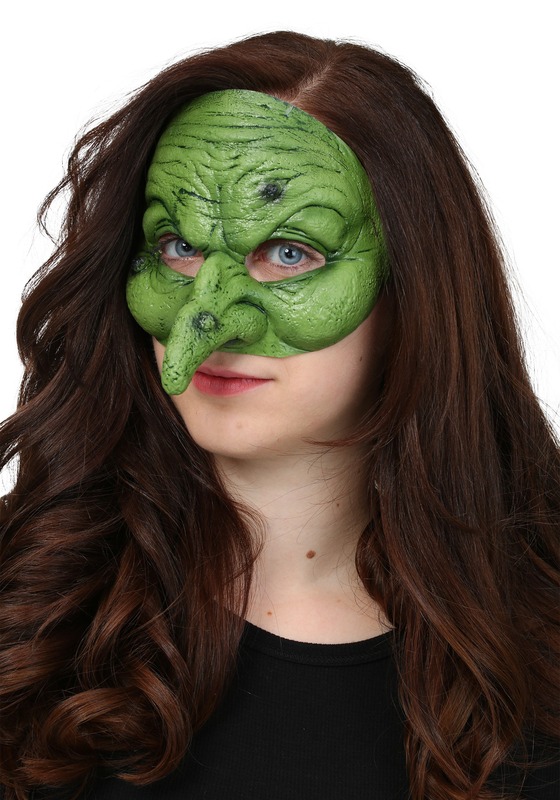 Want to have that classic wicked witch look this year for Halloween, but without having a clown's worth of cosmetics on or a stuffy mask suffocating you? Well, before you go looking through the nearest spell book, drop your worries. We've got you covered. Check out this awesome Adult Witch Half-Mask! You can be the spookiest witch at any Halloween party this year with no worries of smearing your makeup or over-heating due to a poorly ventilated mask covering your entire head. Nope with this awesome half-mask you'll look more wicked than ever and be able to enjoy all the tasty treats and drinks at the costume parties you attend. Complete your costume with a creepy pointy black hat, an enchanted broom, and a cute cocktail dress. The best part about this mask only covering half your face is you can let out the best cackles anyone has ever heard without being muffled in the least bit!